What has helped you prepare for the level II exam. Study twice as much as you did for the Level I exam. Seriously. I owned Level I in 2009, did the exact same thing for Level II in 2010 and just got destroyed. twice as much is the minimum. the most dangerous time during L2 prep is when you think you actually understand something. you don’t. not like you will need to for the L2 exam. you know nothing and your goal is to know everything. do every EOC question as you finish each reading. then go back and attempt to do them again after two months have passed since you’ve visited the study session. then do them again in May. do absolutely nothing else with your life starting in April until test day next year. that will get you half way prepared for L2. use cfai’s text book. DO NOT REPLY ON any prep courses. and try to link concepts together. remember concepts independently won’t do you any good! i have learned this the long and hard way. Do not buy QBank or use schweser at least for the learning - to review, schweser texts can be helpful. This time I was quite disappointed by the QBank…except cruching the concept again and again it stays very high level regarding the number of concepts in the CFAI text. I am thinking more particulary about concepts such as Excess Earnings approach or Direct Income capitalization. It wasn’t mentioned in the secret sauce neither. On top of that dedicate enough time and try to link the concepts together. It’s no one-question then another topic…but six questions that might be inter-related. If you miss the first one, you will probably fail the next one. Do it once slowly and in full…then take a break or do exercises. Go through once more slowly. Then dedicate May for full review and last time study. I was able to use schweser for ALL of L1 and crush the test. 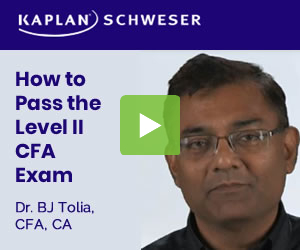 For L2, forget schweser and use ALL CFAI. Q bank was worthless in L2 for me….it was a HUGE help in L1. Schweser L2 eratta was embarrasingly huge….they had very big testable concept thats were dead wrong. How easy would it be for CFAI to review Schweser’s eratta and test the conceopts that Schweser taught WRONG??? i honestly worked 1.5-2x harder on L2 than I did L1. that said, I put in A LOT of time for L1 (I think I did every Q-bank ? and EOC) and could have easily failled L2. so in terms of energy, you may need >2x effort levels to pass. 5x seems a bit much unless you really took it easy in L1. Lastly and more importantly PRAY. your heart may belong to Jesus, but your a$$ belongs to CFAI. As many others have said, be prepared to work a lot…lot harder than you did for level I. Level one, I studied usually 3-4 weekdays for 2-3 hours at a pop. Started in early Sept and sat for the Dec. exam. Mainly watched videos and Qbank. One day per weekend would go to the library and study for 3-6 hours. Final three weeks, I increased my study time to 4 weekdays per week and both weekend days. Passed first attempt. Got my results in late January, started studying for Level II. After about a week, I realized that sticking to the same less intense studying schedule was not going to be enough because the material was SO MUCH DENSER. I think there’s actually fewer pages [or fewer books] of material for level II than level I, but it’s just much much harder. Anyhow, I upped my study schedule pretty significantly. From Feb-early May, I got up an hour and a half earlier so I could get in an hour+ of studying before work. Studied after work almost every day at the library. Used the videos I bought from Schweser but also read the texts front-to-back. Weekends meant a minimum of studying 3-5 hours both days. Starting in May, I upped the pre-work studying to every day and spent every day at the library afterwards for at least a few hours. Weekends meant library from when I woke up [usually later, maybe 9:30 AM wakeup, library by 11] till it closed at 5. After all that, I’m still not confident that I passed. Don’t let this get you down; passing the level II exam is not impossible, as thousands of people struggle through it every year. But it’s many orders of magnitude tougher than level I, at least for me. Everyone learns differently so I would recommend a mixture of several sources to ensure you are capturing the big idea as well as the details of each reading. I have found the CFAI texts to complicate things more than they need to be (especially the derivatives section) so in these areas the notes are a good tool to fall back on and get a good idea of what is expected of you to know. Forgot to mention, as for study hours: wake up and get an hr in before work, put in 30-45 over lunch and then at least 3-4 after work. As for weekends, go all day with a few hour break for dinner. Usually burned out by 10:30 - 11:00, starting in end of January. > courses. and try to link concepts together. > good! i have learned this the long and hard way. use the ntoes, dont use the text, unless you have lot of time.